A soft breeze, warm with the heat of an Arizona October, brushes my face. The scent of stale popcorn, bubble gum, and dust hangs in the air. I squint against the bright sunlight and scan the field. My 6-year-old-the-size-of-a-9-year-old has assumed the ready position way out in left field. Again. Never mind the pitcher hasn’t even made it to the mound yet, and that this is his third time in left field this game. He’s ready. At last, the pitcher saunters to the mound, a wad of gum bulging his cheek. “Alright, c’mon, kiddo. Just like we practiced!” A man’s voice rings louder than the din. The kid, with scruffy hair hanging out the sides of his cap and his shirttail untucked nods decidedly as his dad. He stands tall and raises his gloved had in front of his chest. He squints at the catcher. Shakes off an imaginary call, checks the bases for stealing runners—never mind the fact that this is the first batter—and his shoulders rise and fall with a large sigh. He winds up and fires the ball. It sails far over the catcher’s head, clanks into the backstop, and a mad scramble ensues. Pitcher, catcher, and third baseman scramble for the ball. Dust and limbs flying everywhere. The ball finally recovered, all the players return to their posts and in unison my son’s team assumes the ready position. I smiled at the scene now so familiar. Every game was the same. Sure, the players rotated positions and a different pitcher took the mound every few innings, but the basic play was the same. And it reminded me, oddly enough, of me. It’s funny the things you ponder sitting in dusty camp chairs every Saturday for weeks on end, watching little boys and girls strive to be like their big league heroes. And one thing I’ve realized over the weeks is that Little League baseball is a lot like my spiritual walk. And I’d venture to guess, it’s a lot like yours, too. 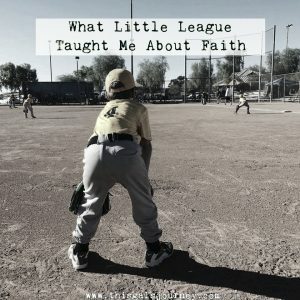 So, I wanted to share with you a few things Little League taught me about faith. 1. The game rarely ever goes like practice. So many times, I sat at practice and watched my son nail hit after hit. Or make stellar throws and speed around the bases, a wide grin splitting his face. But on game day. Oh, things were always different on game day. It was serious. He was nervous. He struck out far more often than he did in practice. And those throws? They never seemed to hit their mark. Sound familiar? Sitting in my cozy spot on the couch, dog in my lap, Bible in hand, my “practice” time is a joy. God’s word sings in my soul, profound insights burst in my mind and renewed purpose steels deep in my soul. Then comes Game Day. My kids wake up, the dog pukes on the rug, and my perfectly engaging lesson falls flat for my middle schools students. Suddenly those insights are a lead chain around my neck. The joy from my morning practice shoved aside by annoyance and frustration. Then comes The Big Game. You know, Game 7 of the World Series big. The notice of layoffs comes. Or the doctor calls. Or another bill arrives. Yes, it’s true. The game rarely ever goes like practice. 2. Ready Position is a big deal. It never failed to amuse me. One kid building sand castles at short stop. Another crawling around, tracing the path of a beetle. Yet another is picking his nose, confident he’s far enough in the outfield no one will notice. Suddenly, a voice splits the air. Coach. “Ready position, boys!” Obediently, they snap to Ready Position: forearms rested on thighs, knees bent ready to spring into action, eyes on the pitcher. After every play, they return to ready position. From this position, they can spring into action in any direction at any given moment. It’s designed for maximum speed and efficiency so they can pounce on the ball or lunge to make a catch. We have a ready position, too. Sometimes we need reminding. That’s why we tape Bible verses on mirrors and save them as lock screens on our devices. We listen to worship music in the car and start our day with prayer and Bible study. We need our hearts and minds in ready position. Postured with ears open, eyes wide, hearts softened, ready to spring into action at the slightest nudge of the Spirit. And if we get shaken, or after the action, we return. Ready for action. Ready to listen. Ready to jump when the ball comes our way. 3. Listen to the coach. Little boys like to run. Better yet, they like to run in dirt. I lost count of how many times a little leaguer sprinted around the bases, slid into home, only to be met by serious eyes. “I told you to hold off at second base. That is the fourth run, and now we have to change sides. If you had stopped when I asked, more people would have had the chance to bat.” Oh. Sometimes, we’re running full steam ahead, goal in sight. The light at the end of the tunnel has been turned on. We can see our destination. We’re so close we can taste it. And then we hear that Still Small Voice imploring us. Slow down. Stop. Not yet. The tug-o-war of the heart ensues. But, it’s right there. I’m so close. “Stop.” We need to listen to our Coach. We were given the Holy Spirit as a gift. A guide. A coach. He knows what is best for us, and the best way for us to get there. He doesn’t tell us what to do just for the joy of hearing the sound of His own voice. No. There’s a game plan. A strategy. If we barrel ahead, we may interfere with what He has for us. Or for someone else. We may risk the entire game thinking we know better. We need to listen to the Coach. 4. Have fun! Many’s the time we had to remind our little baller that it was just a game. And while, yes, there are winners and losers…well, not in this age of Little League, but still. Work hard? Yes. Try your best? Absolutely. Take it seriously? For sure! But taking it seriously doesn’t mean we can’t enjoy it! Sometimes we make following Christ look about as enjoyable as latrene duty or grave digging. Yes, it’s serious business. Eternity is on the line. But Christ himself said He came to give us life—abundant life! It’s ok to enjoy this life. This world. Our families. Our jobs. Our churches. There is great joy and freedom found in Christ and we would be well served to allow ourselves to fully embrace and experience that joy. 5. Cheer on your teammates. Our son’s coaches did a great job trying to instill the character of sportsmanship into the members of the team. They celebrated one another well. It can be all too easy to view others as competition. Especially when they are playing the position we wanted to play, better than we know we could play it. We need to support one another. Cheer one another one. Dust each other off when we fall, and celebrate the successes of those on our team. By the way, our team is humanity. So, what do you think? Do you see yourself in these Little Leaguers? Which one do you sense the tug to work on? What other lessons have you found in the ordinary things of life?